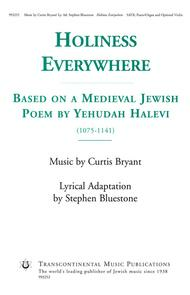 Based on a Medieval Jewish Poem by Yehudah Halevi. Composed by Curtis Bryant and Stephen Bluestone. Transcontinental Music Choral. Jewish. Octavo. 20 pages. Transcontinental Music #993253. Published by Transcontinental Music (HL.191482). 6.75x10.5 inches. Curtis Bryant/Stephen Bluestone. 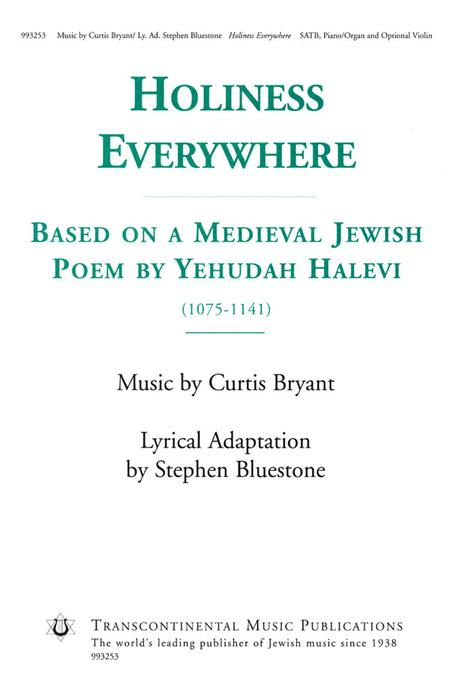 An English setting of Yehudah Halevi's medieval poem, Yah Anah Emtza-acha, Holiness Everywhere is, simply put, a perfect marriage of music and text. Bryant captures the awe and fear of acknowledging God's omnipotence. Though especially appropriate for Yom Kippur (Day of Atonement), the piece is too good for only once a year. It will not be difficult to find an excuse to sing it!